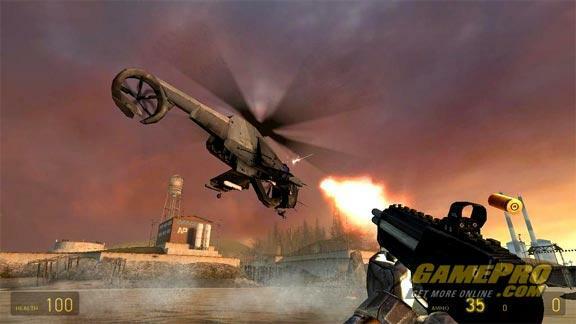 OO look at the pretty helicopter..............AHHH its shooting at me its ugly now! Striders, mechanical monsters with tall telephone-pole legs patrol the streets, prepared to skewer insurgents. As if anyone was willing to stand up to the planet's oppressors. Some have sold out to the off-world fascists, and clips of the frighteningly calm turncoats play throughout cities to further pacify the populace. Impulse and instinct, they insist, are a plague. The visitors, according to the old sci-fi chestnut, are our friends. A mere 10 minutes in, and the latest Half-Life sets its atmosphere with convincing, blood-curdling aplomb. More so than any other game (Halo 2 included), it puts you in the head of its hero, and gets better as you go along. You are Gordon Freeman, science geek turned savior, and you're more than happy to doff the lab coat and lodge a crowbar (or a pistol slug, or shotgun shell, or crossbow bolt--you get the picture) in whoever deserves it. But of all the tools of the E.T.-go-home trade, the gravity gun is your silver bullet. 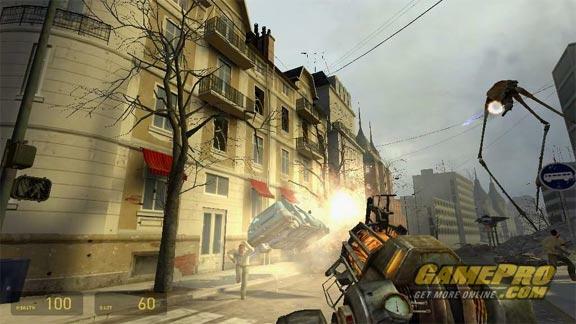 Able to lift and launch whatever you like, it turns debris into lethal weapons and the shooter status quo upside down. The way things fly, catch fire, and fall not only carries consequences that add weight to your war of the worlds, but also creates situations that reward guile, guts, and instinct. Sometimes one broken beam produces better results than a magazine of bullets when the catwalk it supports collapses and crushes your foes. The enemy is smart too, maybe more so than in any other shooter. They'll chase you down as you dash for cover; pin you with fire, then put pressure on your flank. Their helicopters hunt you through warehouses, open up as you pass windows, and blast the roof to bits to get a bead on you. It's remarkable really. In fact, everything about Half-Life 2 is remarkable. First-rate audio effects capture the sounds of spent cartridges clanking on the floor, rifle shots reverberating off walls, and head crabs hissing in corners. Levels range from canals to cemeteries, coastal highways to crowded cities, sewage systems to state penitentiaries, science facilities to strange fortresses--each lifelike and with a feel of its own. Some place you behind the wheel in sweet, plow-suckers-into-street-pizza sections, others put you in charge of fellow freedom fighters and bloodthirsty, bear-sized bugs that eat lead for lunch and ask for seconds (think Pikmin, but with lethal aliens instead of lovable plant people). Gameplay, graphics, you name it, it's top notch. On its own, Half-Life 2 is everything you asked for. And that's only the half of it. Depending on the package you pick, you also get the original Half-Life along with cyber-caf? staples Counter-Strike and Day of Defeat, all redone with today's technology. Consider those expensive PC parts paid for in full.